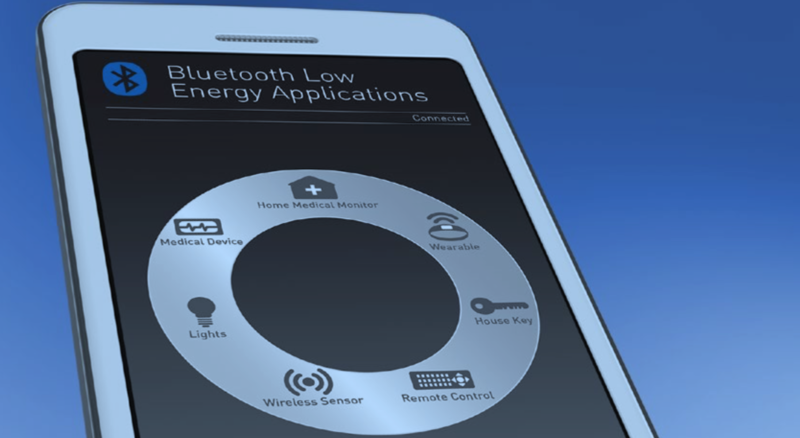 Energy-eficient and economical Bluetooth Low Energy (BLE), also known as Bluetooth Smart, was created for the Internet of Things (IoT). This wireless technology is poised to power a wide range of connected applications, from wear- able tness devices to smart homes to the latest entertainment products to in-store advertising using beacons, and more. If you are looking to build better end applications with lower power consumption, we are now offering two next-generation BLE solutions with an easy-to-use ASCII-style command inter- face that makes the devices easy to con gure and eliminates any complicated code compiling. The RN4870 and RN4871 support the latest Bluetooth 4.2 speci cation and have a Bluetooth stack on board with a scripting engine to enable standalone operation and eliminate the need for a microcon- troller (MCU) in simple applications. 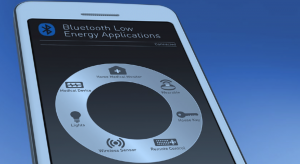 These next-generation Bluetooth devices enable a fast time to market and improve the total manufacturing cost for your design. The RN4870 and RN4871 deliver up to 2.5 times the data throughput improvement over previous-generation products that are based on the Bluetooth 4.0 standard. In addition, these new Bluetooth solutions offer Federal Information Processing Standards (FIPS) based connection security coupled with advanced features. They can seamlessly transfer serial data over BLE devices and can support di erent beacon formats like iBeaconTM or EddystoneTM via a single command. Both devices, which also come with a shield option, are fully certi- ed to meet worldwide regulatory standards and are available with compact package options as small as 6 × 8 mm. This, combined with a user-friendly interface, helps speed up your product development. 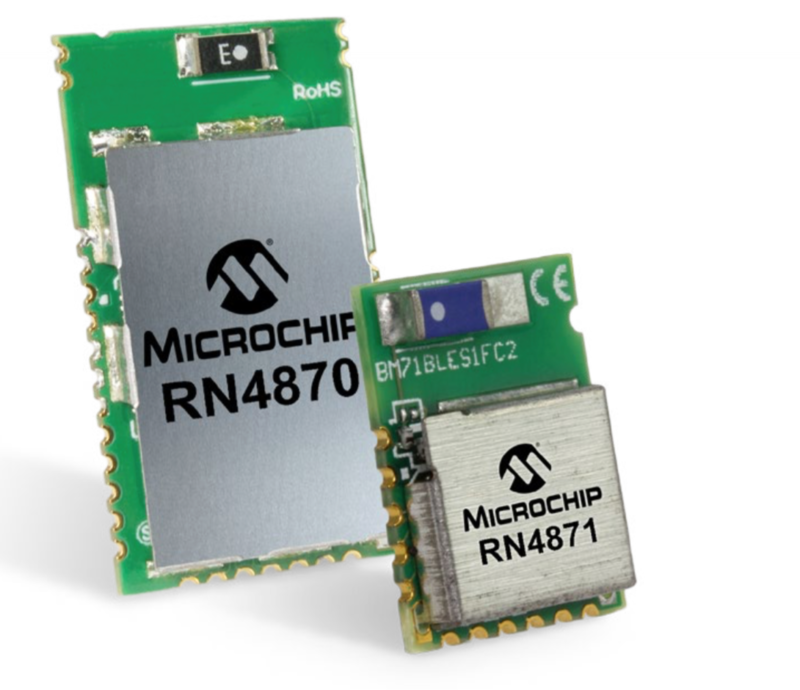 These new RN-style modules are the easiest ways to add our BLE solution to your products. Each module has an on-board software stack and pairs well with any of our large range of low-power microcontrollers or any microcontroller with a UART interface. The RN4870 and RN4871 are also excellent complements to our diverse low-energy solutions that target IoT applications. To help you get started with developing your BLE application, the RN4870 Bluetooth 4.2 Low-Energy PICtailTM/PICtail Plus Daughter Board (RN-4870-SNSR), with a plug-in sensor board, works out of the box or can be interfaced to the PIC18 Explorer Board (DM183032), the Explorer 16 Board (DM240001 or DM240002), and the PIC32 Expansion Board (DM320002). Two iOS® applications are also available for use with the RN4870: Microchip’s Smart Discover for iPhone® or iPad® and the Bluetooth Smart Sensor app.